Hello here i am the Samsung Galaxy Grand now i become one of the Samsung phablet Family. Today the Samsung has launched its new product GALAXY GRAND.Which costs a nominal price for a common man in India.After the rumors of the Galaxy Grand the techies were eagerly waiting to get hands on to that mobile ever since the news came about this phone on the web. In this era of mobile phones daily the technology is getting improved and making our life easy and simple.Before the past ages where there was no mobile phone and its services, at that point of the life it was very hard to maintain time and work. But thanks to the Mobile Technology and the innovators of these things who are making our life and work at ease.Now no more going to shopping malls,Electricity office,Banks and etc. With the help of these types of phone we can do all these work from one place itself. Samsung Galaxy Grand can also be called as a Phablet.Since it has the capability of a tablet and a phone,so the name goes like phablet. Now samsung has got a new member to its family list.It is a latest android device which has lot of applications which are seen in the Galaxy Note2 and the S Hybrid. This samsung Galaxy Grand was launched today in the India and all over the world.Which has a Dual sim and priced at Rs.21,500.This can be available in the month of February at all retail shops of samsung. 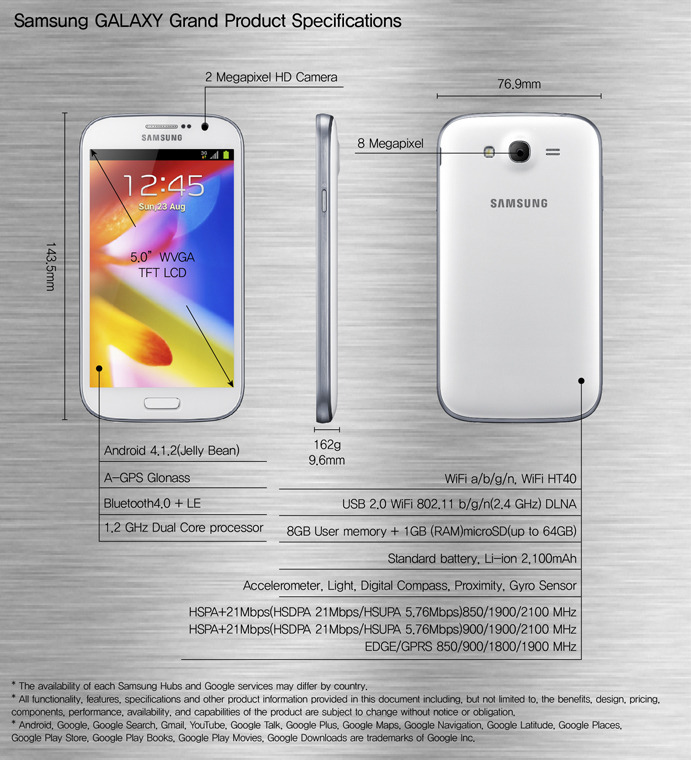 These are the unique features which can be seen in the new galaxy grand android mobile phone. By which i can assume that the customers will be much more attracted by this new features and the specifications of this latest mobile phone. Today at the event of the launch Mr.Asim Warsi,Vice President,Samsung Mobile says that this new galaxy grand phone will take the samsung selling to a next level. They considered this phone as the best dual-sim phone with enhanced qualities with a larger screen.This can amaze the customers and sure this is gonna be a best selling piece of the year. Hope you all like the preview of the latest Samsung Galaxy Grand mobile phone.In the month of the February the phones will hit the retail market in the India.Then you can hands on to this amazing mobile. Any thing missing in this preview.Keep your views in the form of comments down below. Hi Jay, Happy that you like my review on this phone. Sure i will check your article. Thanks for the review Sampath. Looks like one of the phones that I have to put in my wish list. Yes you are right dude.Since it is available at a nominal price with a extra feature that is Dual sim. I must say Samsung has come up with something really new stuff in the mobile market. I have personally use this cell and it is really awesome. the camera, feature, speed and the double sim card feature has really bought something new in Indian market.